"My compulsion to write does not occlude the uselessness of filling pages with words" writes Fernando Sdrigotti. "I know that what I do is pointless, one more message in a bottle in a moment when everyone else around me is also casting messages adrift". He expresses sadness at the sight of so many washed up on the shores of labyrinthine bookshops and, to mitigate the condition, offers a mutated version of Borges' infinite library in which an infinite number of alphabets are postulated with their own infinity to be filled, leaving more spaces than even Borges allowed for: "We go after those gaps, selfish that we are". This admittedly contrived excuse to continue is one response to a problem that has confronted writers for over a century, with perhaps Samuel Beckett's response to Joyce being emblematic, though curiously it's a problem that fails to affect filmmakers, composers or painters. At least, it isn't visible in what they produce. While biographical material might reveal Alfred Hitchcock self-harmed in the presence of so many other psychological thrillers, what he produced does not bear its scars; or, rather, those scars are indistinguishable from perfectly powdered skin. For writers, however, consternation at the pointlessness of adding to an infinite number of books leads to at least three outcomes, the last of which is perhaps unique to writers: first, silence, in the form of never writing again, or at least never being published; second, denial or indifference, in the form of publishing regardless, and third, subjecting the writing to the condition. The last is unstable ground for sure, threatening idiosyncratic, fragmented structures invariably prompting disillusion and contempt from marketing departments and consumers wandering the aisles. Why not give up writing to make a living in what everyone says is the art form of the modern era? Well, if you need to ask, you might be free of the compulsion. So what are the details of this pathological condition exactly? Sdrigotti does not analyse, preferring to leave the personal need to write in the shadow of the shelves, and given the historical conditions in which the publishing industry has come to define literature, setting mass market genre fiction and celebrity biographies alongside Beckett's novels and the poems of Paul Celan, it should be no surprise. Yet, as soon as the industry in the form of conglomerate publishing, chain bookshops and careers as a bestselling author is recognised as inimical to the compulsion, as soon as its shadow is removed, that sadness, that sense of pointlessness, is replaced by something much more interesting. Jeff Fort does this in his study of three writers who experienced "the literary vocation as an all-consuming task" when the time for such a vocation had apparently long passed. What results is a revision of the focus and purpose of modern fiction and should be vital reading for the sad writer. He begins by examining each author's stated reasons or excuses for writing. Kafka's grand self-torment is familiar to us – “God does not want me to write, but I, I must” – as is Beckett's self-deprecating manner – Bon qu'à ça; writing is "all I'm good for" – but the third less so. Maurice Blanchot's author biography heading his collection of essays The Book to Come includes the line: "His life is entirely devoted to literature and to the silence that is proper to it”. As this is both hyperbolic and self-effacing, it embodies Fort's contention that all three keep a flame alive however faint for "unparalleled satisfactions, not to say ecstasy" in writing and, what's more, some kind of transcendence, and this is what makes them stand out among so many others. The need for goodness is easily missed in the "good" of Beckett's statement, as is the need for salvation in Kafka's letter, but they are there, and both are sought in silence. All three expressions are included in Fort's "downward displacements" of intellectual history following Luther's stand at the Diet of Worms and Kant's philosophy, making it clear The Imperative to Write places the predicament of the modern fiction writer in deep history and seeks to confirm the significance of these writers' work through its modesty, as it completes a trajectory from church pulpit through university lectern to solitary writing desk. What is “real” in this radically fictive space has nothing to do with representational realism, but emerges rather from the sort of insistent and irreducible drive ... that stubbornly inhabits literary speech. He calls this habitation "a literary alterworld," one that punishes the writer as much as rewards, as it "separates language from the world it names" and sets the author at "an irreducible remove" from the everyday world, perhaps embodied by the unpublished writer traipsing the aisles, where a book has at least an alibi for its emptiness in its physical, commercial reality. While this is also the celebrated freedom of creative writing – let your imagination run wild – it is also never far away from real world contempt and its timid apologists with their so-called Reality Hunger. However, writing fiction is not quite reality and it is this 'not quite' that is the "irritating breach, a hollow kernel in the language that cannot be voided" and one that "opens the spaces of an imperative that cannot be fulfilled". Such a residue, Fort says, "is all that is left of writing's sublimity". It is this residue that the three writers pursue in their own ways. Fort's three central chapters present close readings of their fiction in order to see how the imperative compels or structures specific works of fiction. These chapters were extremely difficult for me to summarise, so what follows is a crude outline that leaves out a great deal and may misrepresent as a result, for which I apologise in advance. The protagonists of these stories must plead a case for innocence before a hostile, aggressive, or at the very least highly skeptical judge; and the failure of their self-defense casts into doubt the very medium in which Kafka himself struggled to conjure them: language as the persuasive presentation of an otherwise occluded interiority. The enigma of Gregor Samsa is that his innocence remains "invisible and unpresentable," as he is visible only in his socially beneficial role, which correlates with writing as a means of interactive and commercial utility rather than an extension into the voided sublime. Kafka's great task then is mount a self-defence in the very form taken by the accusation; with Fort's emphasis: "to take hold of power in speech, in such a way as both to appropriate and undo that power in the very grounds of its possibility". The imperative in these works, which Fort gathers together as "judgment stories", is to present the inner reality of an individual against the law or as part of a sublime law now out of reach. The later fiction is notable for being less melodramatic and more clearly projecting 'the destitution of the sublime' into writing. In A Hunger Artist, Kafka's great talent is presented as a negative, with showmanship displayed as a withdrawal from showmanship. This is the paradox in which his fiction must breathe. The story ends with the artist saying he didn't starve himself out of choice but because couldn't find the food he needed. But this is only another image of the void where there is no image: "the hunger artist's search is not for a food he 'never found' but rather for the nothing that he cannot grasp or make graspable". The sublime is as destitute as the showman. But it is in Blanchot's fiction that Fort wonders whether "ghostly returns" might traverse this gap, "an unloseable something that is not a thing", specifically something left behind by the 'feminine specters' in the récit Death Sentence, and present as we gaze at the death mask of l'inconnue de la seine, an image that Blanchot displayed on the wall of his study in Èze and is on the cover of this book. The separation is present in the movement of writing fiction, with the abyssal fault borne in these figures so that their presence in a life evokes "an extreme mode of loss". It is the imperative to write that provokes the haunting of these fascinating images, with fiction originating in the ghostly encounter rather than something reported after the event, not a confession projected into genre features but "something yet to come, an imminence whose lack of reality awaits its realization in the récit itself". 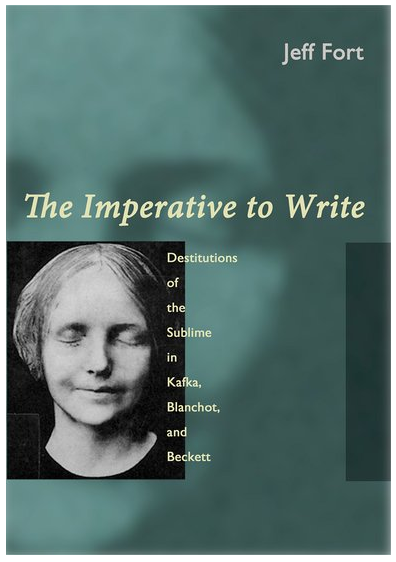 In this chapter, Fort takes issue with Blanchot's insistence on the separation of the biographical facts of a writer's life and the work, and this is also the focus of the chapter on Beckett, whose fiction lives in a similar relation to Blanchot's but differs in "the carefully cultivated melancholy, and even nostalgia" in responding to the loss of the world, which in Beckett's case maintains clear parallels to his life. Fort is especially good on the tension between formal precision of Beckett's fiction, which might hold these at a distance, and the "lyrical transports" that bring them close. The latter evidently allows what others call Beckett's experimentalism an alibi into mainstream appreciation. In July 2015, the actor Richard Wilson presented a documentary in which he conceded that Beckett's work "can be difficult and obscure" but added "there is one heartbreaking play that he wrote...his most autobiographical", so that his work is received as displaced self-expression alone, whereas it is according to Fort precisely the incompatibility of the abstract character of the fictive voice with the particularities of a singular life that sets Beckett's work apart. If the condition of possibility of such fiction is "the loss of the world" in the destitution of the sublime, the voice is also driven "by the indescribable charge produced by the unbridgeable distance from what has been left"; a distance, as we have seen, that is opened by language. And it is with this in mind that Fort makes a key point when he says "the words we read when we read The Unnamable are written words, and not the supposed stream of a supposed consciousness". It is in this novel that fiction is divested of characters and events, making it rely on its sources in the now-destitute sublime, which nonetheless, in an apparent paradox, allows the intrusion of reality "in a way that is impossible in more conventional or 'realistic' fictions". We've come a long way from the initial compulsion to write, with the image of an infinite library replaced by an infinite nothing beyond its infinite shelves, and perhaps as a result a greater sense of the uselessness of writing. Except it is in the denial of reality in its widest sense as characterised in The Unnamable that our sad and frustrated compulsion to write persists. What excites me about The Imperative to Write is that it presents a perspective on what we carelessly call experimental writing that might catalyse many a writers' despondency and turn it into the work they were born to write. It is certainly one of the most extraordinary books about literature that I have ever read, one that has compelled me to write about in order to raise awareness of its ideas. In the months it took me to read (the text including the notes reaches a quarter of a million words) I couldn't help but wonder about its own relation to the destitution of the sublime, and this intensified during my troubled attempts to summarise such a complex and detailed book, steeped as it is in philosophy and close readings of all three writers in their original languages. That is, what relation does this have in terms of literary history to the works under discussion, or, more specifically, are the works under discussion themselves kinds of summaries, albeit a highly stylised, of what such a profound study thickens and fills out, so that critical exposition is not so much secondary text feeding like a parasite on the larger organism but a continuation of the same movement in the form specific to our time, much as Luther and Kant might be considered as part of the genealogy of modernism despite the forms taken by their writings? In one aside, Fort refers to modernism as "a name for the sounding and unfolding of depth and interiority, its radical externalisation: inwardness as boundless exteriority," which happens to be a good way to summarise the first two volumes of Knausgaard's My Struggle, books that transcend their rather mundane, non-experimental form because they reach toward the distant horizons of a life. And remember, the writings by which we know Kafka, Blanchot and Beckett take many different forms – diaries, letters, short stories, novels, plays, poems, even critical essays and book-length studies – with not one demanding any fundamental priority. In contrast, contemporary works of such dispersed singularity and focus appear to be impossible, as if the disenchantment of the world, which might be another name for the destitution of the sublime, has been internalised to such an extent that fiction in particular is content to be trapped in its own freedom, its own blank space of infinite invention. A book like The Imperative to Write might be able to jolt some writers out of such complacency, though I wonder if another version might be necessary to do that, one that is abridged to make it more financially accessible, much as My Struggle requires its excessive length to achieve its unexpected goal. Fort himself wonders if Blanchot "did not work too hard to maintain his noble manners" while Beckett’s "bawdiness and vulgarity" allowed for "a more palpably painful scattering of remains," and, when discussing Blanchot's preoccupation with dates and numerology, he inserts a moving footnote pointing out that Blanchot's fifth birthday on September 22, 1912 is the day Kafka famously wrote The Judgment, and that it is also the birth date of his late brother, to whom he pays "discrete homage" each time this date arises in his reading. What this latter signifies is left open to speculation and leaves one wanting more. What it also does is to reveal the possibilities of alternative forms that may be open to us to explore this strange imperative. As the contrast of noble manners and vulgarity suggests, the form of such explorations is also subject to the chance conditions, and perhaps only in submitting to the initial compulsion to write allows us to transcend them, a suggestion that itself contains the paradox in which writing must begin. Thanks for writing this inspiring post.